French sculptor. He studied drawing in Besanon before travelling to Paris, where he became a pupil of Claude Dejoux. In 1790 he was awarded the Prix de Rome with a low relief of the Judgement of Solomon (Paris, Ecole National Suprieur des Beax-Arts), but his studies in Rome were terminated in 1793, when he was conscripted into the French Revolutionary armies on the Rhine. In 1795 he was recalled to Paris to take part in a competition to sculpt a colossal statue of the French People, a project initiated by the wood-carver Jean-Louis David (father of David dAngers) that came to nothing. Lemot made his Salon debut in 1801 with a Bacchante (untraced), which had already been acquired by Napoleon. In 1808 he executed a gilt-lead quadriga to crown the Arc de Triomphe du Carrousel, Paris; the sculpture, which incorporated the Horses of St Marks, looted from Venice, was removed in 1815. The figure of Napoleon that had originally been intended to form part of it, was never executed. Between 1808 and 1810 Lemot sculpted a pediment (in situ) for the colonnade of the Muse du Louvre, Paris. It represented Minerva and the Muses Paying Homage to Napoleon, but in 1815 the bust of Napoleon was replaced by one of Louis XIV. Under the Bourbon Restoration Lemot was principally employed in reconstructing two equestrian statues of monarchs that had been destroyed during the Revolution (1789-95). The first, Henry IV (1816-18), for the parapet of the Pont Neuf, Paris, was based on the original by Giambologna and Pietro Tacca. The second statue was of Louis XIV (1820-25), and replaced the original by Martin Desjardins in the Place Bellecour, Lyon. Shortly before his death Lemot was rewarded for his services to the restored monarchy by being created a baron. 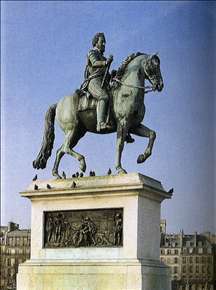 See more details about "Equestrian Statue of Henri IV"